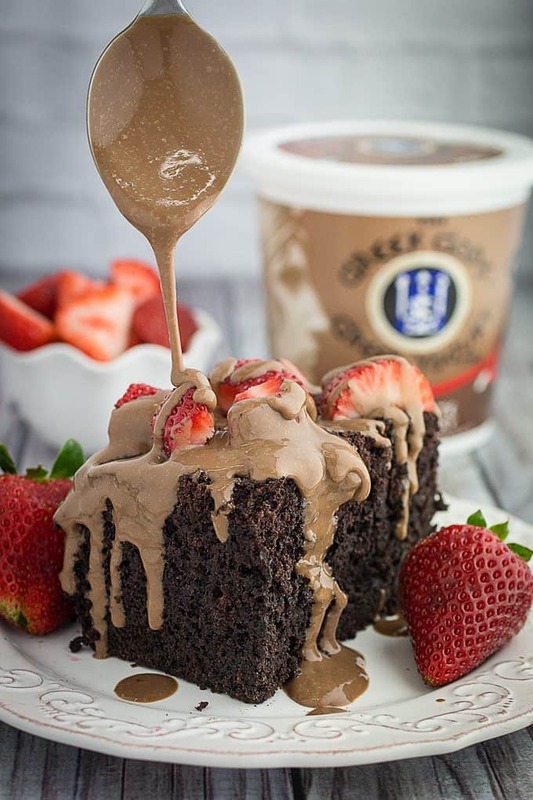 Slow Cooker Chocolate Strawberry Cake & Yogurt Glaze is the most decadent thing that will ever come out of your slow cooker. 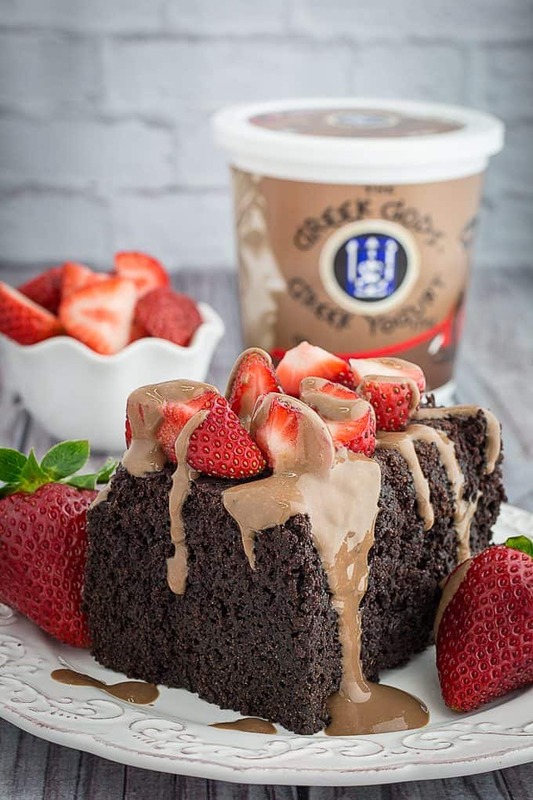 Fluffy and moist gluten free cake made with chocolate strawberry greek style yogurt, topped with fresh strawberries, and drizzled with sweet glaze. Best of all, this cake is so simple and easy to make, you’ll love having it around for the holidays! Are you ready to step into the realm of slow cooked desserts? 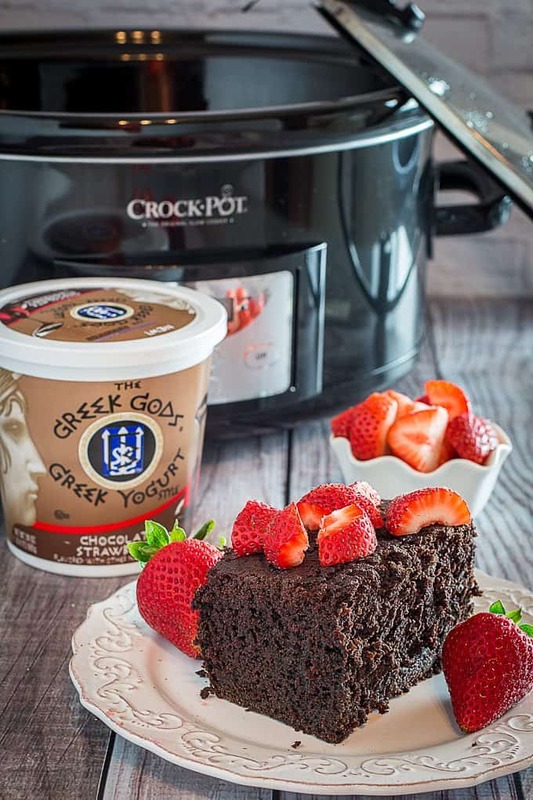 Because this slow cooker chocolate strawberry cake is not only the most magical thing that will ever come out of your slow cooker, it’s also incredibly easy to make while leaving your oven open for other things. Which is especially important around the holidays, when oven space is a valuable commodity. This isn’t just any old chocolate cake, either. Ohhhh, no. 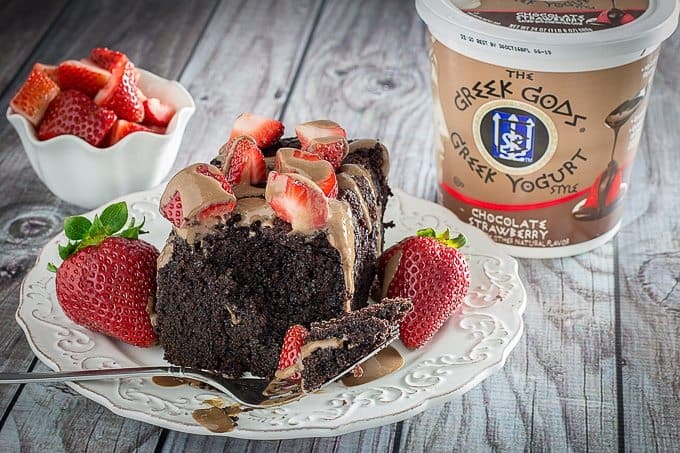 It’s chocolate cake infused with a deep rich chocolate strawberry flavor, topped with fresh strawberries, and absolutely smothered lightly drizzled with a sweet chocolate yogurt glaze. Did I mention all of the chocolate? Because that may be the most important part of this chocolate strawberry cake here. Chocolate, topped with fruit, then smothered in chocolate for good measure. That’s really what the holidays are about, isn’t it? 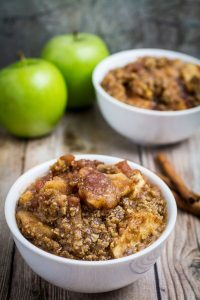 Last year, as you may know, I was all about my Slow Cooker Apple Crisp. Slow cooker desserts are perfect for parties or big holiday dinners, because you don’t need to use any oven space. I may or may not make 2-3 kinds of stuffing, which all require their own space in the oven. What, doesn’t everybody? I’ve even been known to find a random corner in a party and plug in the slow cooker inconspicuously. That is, until it starts smelling so good that everyone is asking what’s in there. Moral of the story? Slow Cookers + Desserts = Holiday Crowd Pleasing Slam Dunk. The best part about this, is that you don’t have to feel quite as guilty here. 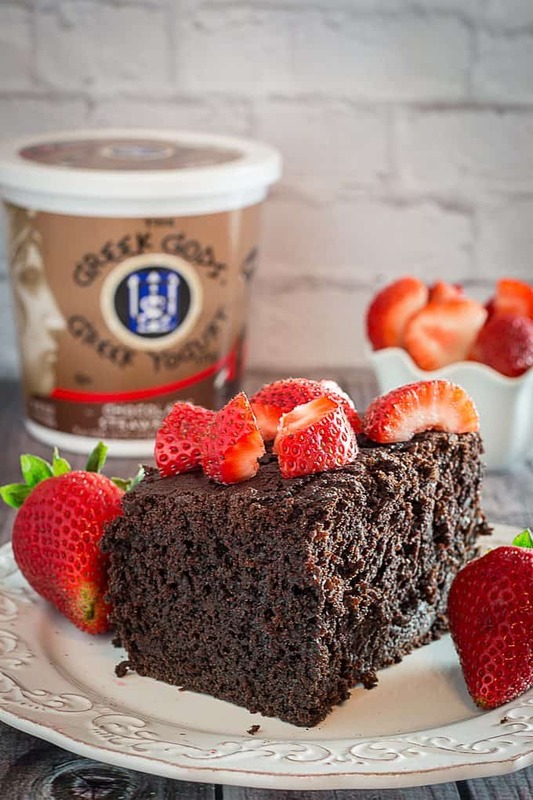 I’ve replaced some of the oil traditionally found in a strawberry chocolate cake like this with chocolate strawberry greek style yogurt from Greek Gods Yogurt. And let me tell you, this stuff is Good with a capital “G”. So good, in fact, that it almost didn’t last long enough to make the chocolate strawberry cake. Which is partially my fault, for not making the “this is blog food” announcement in my house. 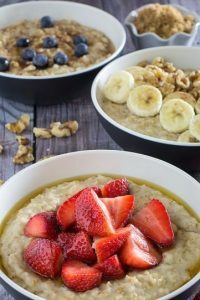 This is a must for certain items, like ice cream, cookies, cheese, and now even the healthier addition of greek style yogurt. And, even better (as if it were possible to get any better than this), is that there are three chocolate flavors to choose from! Chocolate Mocha (which I’m thinking would go REALLY well in my Salted Caramel Frappuccino Milkshake instead of ice cream), Chocolate Cherry, and today’s feature, Chocolate Strawberry. I also want to take a minute to mention that Andrew has been in love with Greek Gods Yogurt from pretty much the moment we arrived in Tampa and happened to find it at the grocery store. I’m not even kidding. He will sit down with the entire 24 oz tub of Honey Salted Caramel and just go to town. It doesn’t even last a day. And I’m ok with this, because as opposed to his usual choice of ice cream, this yogurt has a lot more nutrition going on for it. 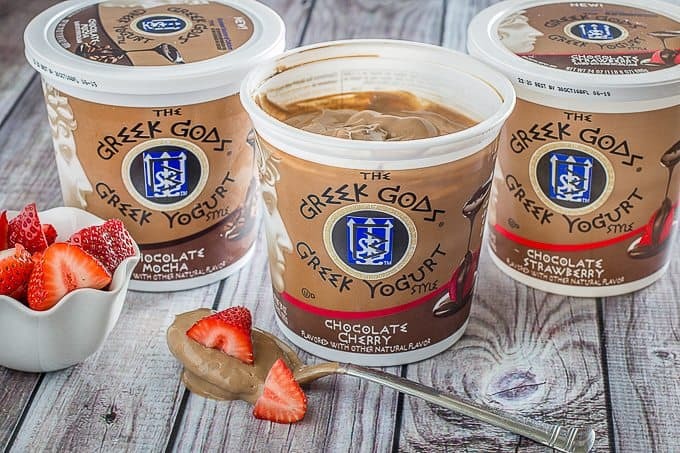 It’s higher in protein, has probiotics, and all Greek Gods flavors are 100% gluten free. They’re also nonGMO and kosher. But recently, since we’ve tried these chocolate flavors, I’m getting more and more into the idea of homemade chocolate yogurt froyo. Because, well, froyo is awesome. The yogurt glaze is probably the easiest dessert topping you will ever make in your entire life. In fact, it’s so incredibly simple, I’m pretty confident that even Andrew could make it. Which is pretty confident! All you have to do with whisk together powdered sugar, chocolate strawberry yogurt, and vanilla extract. There! That wasn’t so bad, was it? No heating the glaze, and no waiting for sugar to melt. 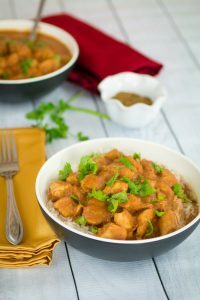 Just a quick and easy topping, and you can add as much or as little as you want. Or, if you’re like me, you can pretty much smother the entire thing. And then some. 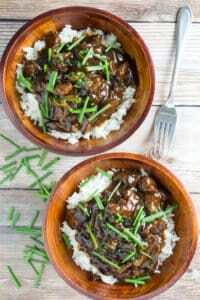 I made this using a 7 quart slow cooker. Don’t worry about it too much if you have a smaller or larger one. If it’s larger, you may need slightly less cooking time. 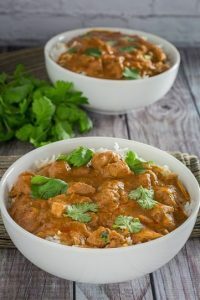 If your slow cooker is smaller, you may need slightly more cooking time. A good rule of thumb is to go by the toothpick test. When the cake finishes, the toothpick will come out clean. 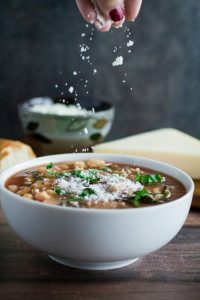 But you should also keep in mind that slow cookers use heat and pressure to cook what’s inside, so every time you remove the lid you may be adding a little bit more cook time to the recipe. I probably opened mine twice to check on it, and it probably needed an additional 20 minutes of cook time. 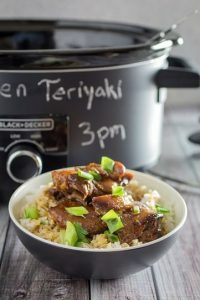 In slow cooker years, that’s no time at all. Just make sure you give yourself a little bit of time, just in case. 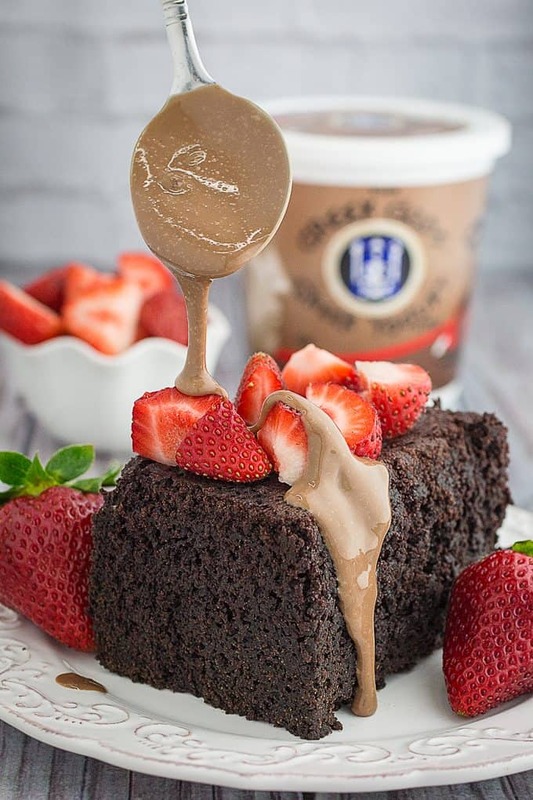 You know, if you’re not into the whole chocolate-on-chocolate with more chocolate thing, you can also enjoy your slow cooker chocolate strawberry cake with fresh berries and simple whipped cream. Now please excuse my while I smother mine in more chocolate. 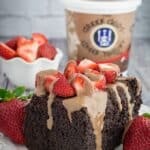 Slow Cooker Chocolate Strawberry Cake & Yogurt Glaze is the most decadent thing that will ever come out of your slow cooker. Fluffy and moist gluten free cake made with chocolate strawberry yogurt, topped with fresh strawberries, and drizzled with sweet glaze. Best of all, this cake is so simple and easy to make, you'll love having it around for the holidays! In a mixing bowl, whisk together dry ingredients (sugar, flour, cocoa, baking soda, baking powder, salt). Add wet ingredients (eggs, milk, water, greek yogurt, vanilla extract). Stir until all ingredients are well combined. 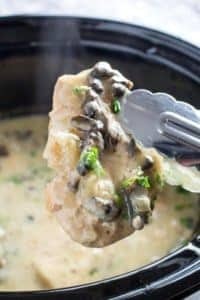 Grease slow cooker, then add cake batter and cover with lid. Cook on LOW 3 hours, or until a toothpick comes out clean. Allow to cool, then top with fresh strawberries and glaze. Whisk together greek yogurt, sugar, and vanilla. *Use a stand mixer or electric hand mixer to make the batter faster. I’m seriously drooling.This looks SO darn tasty and moist and just downright perfect. AND I’m sure it would make the entire house smell divine!